With the sun blazing hot, all of us look forward to jumping into a swimming pool to have some relief from the heat. If you are thinking of swimming pool installation at your place, you must definitely take into account the pool safety. Especially, if you have a pool as well as kids, you have considerably good chances of ending up in the nearest hospital if you do not heed caution. So what can you do to avoid the hospital trip? 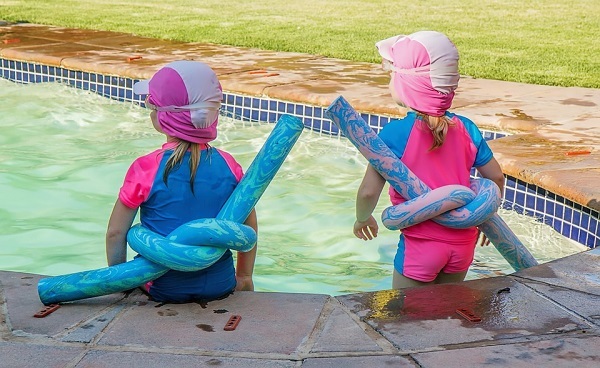 Well, here are 8 Tips to Keep your Kids Safe by the Pool. It prevents accidental entrance to the pools. They are quite strong and can hold kids. Although it is advisable to install a fence around the pool, many of the pool owners are yet to have one fitted at their place. They fail to realize that fixing a fence is a crucial aspect of pool safety tips. A pool fence which has a height of at least 48 inches. It should have a child-resistant gate. It must have a self-closing feature. A self-latching attribute is also recommended. Pressure Sensitive – It is installed at the edge of a pool and has a sensor tube which goes into the water. When something or someone falls into the pool, the resultant waves cause the alarm to sound. Gate Alarms – As the name suggests, it is attached to the gate of your pool. It uses a magnetic field, which when broken by someone entering the pool, will cause the alarm to sound. Wearable Alarms – These kinds are useful when adults are around. It is worn by the kids, for instance around their wrist, and makes a sound when it gets submerged in water. Perimeter Alarm – While planning a swimming pool installation you must also consider setting up perimeter alarms. These intimate you to indicate when someone gets inside the perimeter range by making a sound. Do not merely rely on the door being shut. But ensure that all the doors and windows which can lead your kids to the pool, whether from inside your home or outside, have child-proof locks, or locks that are high enough to limit their access. Further, close up the pet doors which have access to the pool. If you have a pool at your place, ensure that your children receive swimming lessons as early as possible. It will help you with pool safety. Moreover, you, as an adult, could take up lessons in Cardiopulmonary Resuscitation which is commonly referred to as CPR. It will come handy in case of an emergency. Do not run on the wet pool deck. Pool diving in the shallow area is not allowed. Don’t bring glasses near the pool. Do not dive head first into the pool. The best pool safety tip out of all these is to have adult eyes on the kids. Keeping a close watch on them while having a great time by the pool is your best bet. Remember, “it is better to be prepared than be sorry later.” So follow these rules regarding swimming pool safety for kids to have a great pool time during the hot summers. If you have any queries regarding swimming pool installation, do not hesitate to call us. Our experts will assist you in the best manner.